The New England Patriots have once again risen to the top of the heap. Their rousing 28-24 victory on Feb. 1, 2015 in Super Bowl XLIX was a classic. Now it is time to address the business side of NFL Football. It is time to start thinking about those two words which simultaneously create fear and hope; free agency. 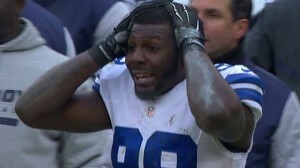 Will Dez Bryant get robbed again ? There are several big names still up in the air. The Dallas Cowboys are still debating what to do with wide receiver DeMarco Murray, and running back Dez Bryant. Last season, both were instrumental in the success of the team, and both are looking for a big bump in pay. No team is immune to the business side of this sport which is so beloved by so many. The Seattle Seahawks are coming off a second straight Super Bowl appearance, but may soon have to “pay the price” as well. That said, looking at the current status of the NFC, Seattle may still be a good bet to represent the Conference for a third straight season, in Super Bowl XLX. Seattle’s star quarterback Russell Wilson, and star running back Marshawn Lynch are both under contract for the 2015 season, but that is it. In order to avoid a tumultuous offseason in another year. Wilson is still under the terms of his rookie contract, and is making less than $1 million per season; that is about to change dramatically. Then there is the case of the enigmatic Lynch, who briefly held out last season. Lynch is said to be contemplating retirement, but it is anyone’s guess as to what his next move will be. The Detroit Lions finally made it to the playoffs, but may lose star defensive lineman Ndamukong Suh. Then there is the rather curious case of Denver Broncos QB Peyton Manning. Manning has said he is ready, willing and able to play in 2015, but has yet to commit to playing with the Broncos. For all players “on the fence”, and teams in a quandary, the clock is ticking. NFL Free Agency officially begins on March 10, 2015. That is the date when teams can begin signing any NFL player not currently under contract. Leading up to that, is the NFL combine, which runs from Feb. 17 – 23. Then there is the big day everyone is waiting for, the 2015 NFL Draft. The draft begins on April 30 and runs thru May 2. Everyone has their own theories on which teams will do what. Which teams are sleepers, and which teams will disappoint ? Would this be a good year to ride the New York Giants or San Diego Chargers ? Remember to go to Topbet Sportsbook to check out the latest odds, and for all your sports gaming needs. This entry was posted in Advertisements, NFL, Uncategorized and tagged dallas cowboys, football, new england patriots, nfl, nfl free agency 2015, NHL, seattle seahawks. Bookmark the permalink.